Thousands of people took to the streets of Georgia's major cities on Saturday in protest at the Georgian government's response to recent events along the country's de-facto border (the administrative boundary line) with South Ossetia. On 10 July, the de-facto authorities of South Ossetia moved border posts several hundred metres deeper into Georgian-controlled territory in the vicinity of two villages—Orchosani and Tsitelubani—in Georgia's Shida Kartli region. A 1.5 kilometre underground section of the Baku-Supsa oil pipeline has now been brought under South Ossetian control, while the de-facto border is now nearly half a kilometre closer to Georgia's East-West highway and the Kartli-2 power line. As in similar incidents, local villagers have now found part of their farmland on the other side of a border which is, at best, sensitive. This gradual appearance of warning signs and barbed wire is known as 'borderisation', a creeping and irregular demarcation of the de-facto state's boundaries since the 2008 war between Russia and Georgia. The potential repercussions extend much further than the comparatively small territorial losses. The Georgian government has had to tread warily, mindful of how retaliation could be interpreted — or spun. Indeed, there is some sensitivity to the timing of this most recent 'provocation', with Georgia having launched military drills with NATO at Vaziani Airbase outside Tbilisi on 8 July and Russian armed forces following suit north of Tskhinvali, the capital of South Ossetia, two days later. 'The Georgian government,' wrote one observer on borderisation in 2013, 'appears to have bought into Moscow's logic that Georgia would be blamed for “provocation and escalation” if it protested against the Russian moves […] imply[ing] that Tbilisi has no option but to acquiesce de-facto.' 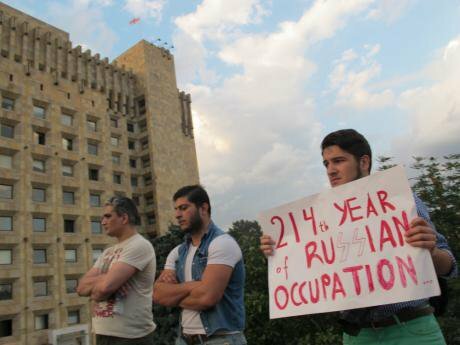 Protesters rally outside the state chancellery in Tbilisi on 18 July. Samachablo is a Georgian term used for South Ossetia Accusations of provocation have been traded by both sides over the past week. South Ossetia's Presidential representative for conflict resolution Marat Dzhioev dismissed Georgian accusations against Russia as 'far fetched and politically motivated'. Rather, these accusations are the result of a Georgian refusal to enter into dialogue with the de-facto authorities and 'summer hysteria' in Tbilisi. Meanwhile, Frederica Mogherini, the European Union’s foreign policy chief and UN secretary general Ban Ki-Moon have maintained their distance, speaking out against 'steps which could be perceived as provocative'. Following two events at the site of the 'border creep', which has taken place near the villages of Tsitelubani and Khurvaleti, law enforcement has tightened access to the sensitive area. On 14 July, over 50 Georgian journalists destroyed and trampled upon a newly erected, bilingual border sign near Tsitelubani, replacing it with a Georgian flag. Two days later, armed men (apparently including representatives of the Russian armed forces and South Ossetian Spetsnaz) arrived at the scene to remove the flag. A certain Robert Gazayev, later revealed to be an official in the de-facto state's border service, demanded that either observers disperse or 'measures would be taken'. Ekho Kavkaza reports that the final decision to restrict access came after an incident on 17 July involving Andro Barnov, former governor of Shida Kartli province. Incensed that the Georgian flag had been removed with no intervention from police or special forces, Barnov insulted the law enforcement agencies. Barnov then blamed Bidzina Ivanishvili, an oligarch who is thought to control the country from behind the scenes, for allegedly removing security from the border area when he became Prime Minister in 2012. 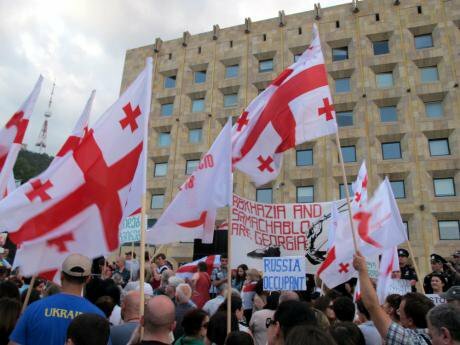 The thousand protesters who rallied outside the State Chancellery building in central Tbilisi on 18 July did so against Russia, 'Russian occupiers' and their policies in Abkhazia and South Ossetia. Yet behind the Ukrainian flags and anti-Kremlin slogans of the 'Stop Russia!' protest lie the bitter rivalries of Georgia's internal political divisions. Caution and a hesitancy to respond to provocation on the part of Irakli Garibashvili’s government has led to denunciations by political opponents: for them, the leadership is weak, inept, or even treacherous. 'The current government is ignoring the Russian occupation, and we're here today to remind them,' smiled Nino, a student, as her boyfriend nodded gravely and squinted at the stage. Several of the groups responsible for organising the protest—among them the television station Rustavi-2, magazine Tabula and NGOs Georgian Democracy Initiative and Georgia's Reforms Associates —are perceived as sympathetic to the United National Movement (UNM), the party of former Georgian President Mikheil Saakashvili. 'If Mikheil Saakashvili was still in charge,' he announced with a disarming confidence, 'this could never have happened'. South Ossetia and the Ossetians themselves came up only briefly in discussion. As Roman added: 'South Ossetia is a Soviet invention; it's called Samachablo.' Samachablo, an old Georgian name for the region, has been used since the rise in inter-ethnic tensions in the late 1980s. The case has been made that the de-facto South Ossetian authorities are delimiting their borders according to the Soviet-era South Ossetian Autonomous Oblast, whose autonomy was revoked in 1990. Roman and Mikhail believed that this 'borderisation' could not have merely been initiated by Tskhinvali with tacit Russian support: it was a direct order from Moscow, if not President Putin personally (as a chekist, the President 'knew everything'). 'If we lock up those traitors – their leaders, then we can live peacefully with the Ossetians again,' they added. The story of Queen Tamar's marriage, who married the Ossetian Prince David Soslan in 1189 after divorcing her Russian husband is often invoked as a historical parable. Georgian-Ossetian relations can be cordial, but only without Russian interference. Organisers had assembled an impressive array of prominent public figures, with an uncompromising and unequivocal message. Salome Samadashvili, once Georgia's ambassador to the EU, warned of the rise of 'Russian-funded politics' in Georgia, adding that time was running out for Georgians to live in a 'modern, European state'. 'We are protesting against Russia's actions, but also those of the Georgian government,' began Giga Bedinishvili of the Tbilisi Free University. The editor-in-Chief of Tabula magazine derided the current format of Georgian-Russian bilateral relations: the face-to-face meetings between Georgia's special envoy for Russia Zurab Abashidze and Russia's Deputy Foreign Minister Grigory Karasin, who last met in Prague on 15 July. UNM parliamentarians have suggested the same, accusing the Garibashvili government of 'defeatism'. For some, the 'Russian occupation' began in 1801 when the Kingdom of Kartli-Kakheti was absorbed into the Russian Empire It was difficult to fathom just what other options would have been open to any responsible Georgian government wishing to avoid escalation (and a loss of human life) in such an intractable situation. 'It's just a line,' said one protester, stressing the word to highlight its patent absurdity, 'not a border.' An ethnic Ukrainian citizen of Georgia, he believed that the line should nonetheless have a constant police presence, and fortification if possible, not excluding closing the Georgian border with Russia at Lars, on the main road between Tbilisi and Vladikavkaz. 'The South Ossetian line is now 400 metres from the main highway. It's now four hours to Batumi and 40 minutes to Russia,' he said, incredulously (and by which he meant South Ossetia). Prime Minister Irakli Garibashvili has called for calm and urged the opposition not to interfere in the government's attempts to resolve the situation in Orchosani and Tsitselubani. Georgia's Energy Minister Kakha Kaladze has similarly given reassurances that Georgia can reroute the Baku-Supsa pipeline around the de-facto border. South Ossetia's new border signs are here to stay. 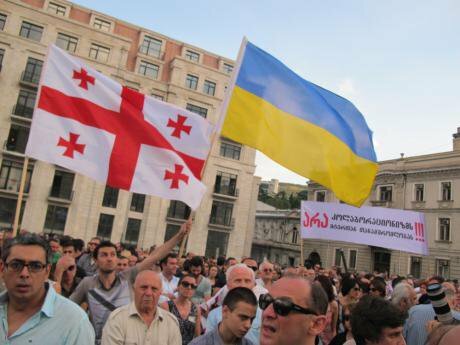 Georgia's opposition is diverse, as are the party political allegiances of those who protested in Georgia's cities. And it would appear that Saakashvili's legacy can still raise a modest crowd — and passions. The 'Russia card' can be played to vindicate the UNM and Saakashvili's policies towards South Ossetia. The Georgian electorate is yet to be convinced, with only 16% of voters surveyed in May prepared to vote for Saakashvili's former party. As the last chords of the Tavisupleba (the Georgian national anthem) played, the crowd began to thin out. A street vendor, who was selling popcorn for the spectacle and soft drinks for the sunshine, remained on the pavement as the banners—and replica border sign—were removed from the stage. South Ossetia's new border signs, however, are here to stay. Such was the outcome of today's meeting in Ergneti held under the auspices of the Incident Prevention and Response Mechanism (IRPM), founded in 2009 to facilitate mediation of potential risks and issues in the de-facto border area. Representatives of Tbilisi and Tskhinvali in attendance found little common ground, agreeing on local villagers' access to their (now South Ossetian) harvest and the return of Vazha Totladze, a Georgian citizen who was seized from his garden by armed men and taken into South Ossetia on 18 July.